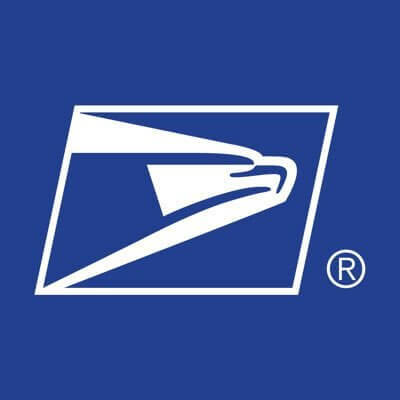 We all aware of the fact that USPS is one of the best shipping centers in the world and provide continuous support in delivering packages and some important materials including USPS first class package service, files, documents, and materials. Beyond this It also provides the service of different types of emails which includes the Retail Ground, Priority Mail Express, and First-Class Mail. Among all these formats of mail First-Class Mail, is the most popular one. Many costumers make use of this service in delivering some important packages or emails within the short span. 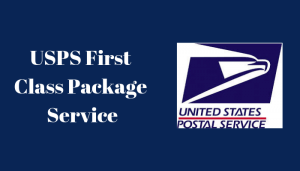 In today’s article we are going to come to know about the USPS-First-Class Mail Service with Delivery Time and what a First-Class Mail refer to and how does it work. So, let us get into the topic. First-Class Mail is the most widely used service of USPS by the customers. Most of the customers opt for this service as it is the best among all other and takes lesser time for the delivery of the packages. The customers might have doubted that “what type of packages can we send via this service”? To aid you all I am providing the list of objects which can be sent through the First-Class Mail. Well, it’s time to know about the delivery timings of the First-Class Email. Although the First Class Email does not provide any type of delivery timings, normally it won’t take more than 1 to 3 business days to deliver the First-Class Mail delivery packages such as Letters, larger envelopes and some standard cards. The customers who opt for this service can get up to 3.5 ounces free with commercial priced letters and cards. The best part about this service is that it covers the policy of Insurance. If in case the First-Class Mail shipments have any damage then insurance is up to $5,000 limited for merchandise only. One can also incorporate this service with other add-on USPS services such as Signature Confirmation to have the confirmed delivery. In the case of the large envelopes, the weight should be 3.5oz. In the case of the parcels, the maximum weight should be 13 oz. To ship any type of package using the First-Class Mail Service one should design or pack the package in the rectangular form. If the package is not rectangular the customer, has to pay the additional charges depending on the type of the carrier. The Package should not be hazardous and not contain any cigarettes and smokeless tobacco. If the shape of the package is non-rectangular, i.e., square, flat, round, lumpy envelopes, vertical envelopes, rigid envelopes along with the button, strings they must be hand-canceled. In this case, you have to pay the surcharge no matter if the weight of the package is less than 1 oz. The cost of the larger envelope will be more while compared to others, in case if the limit, maximum length or width is more as required. You have to pay an extra piece as per the next higher item category. Do anyone have an idea about how First-Class Mail Works? The first thing which we all supposed to do is to seal the item and then mention the address. 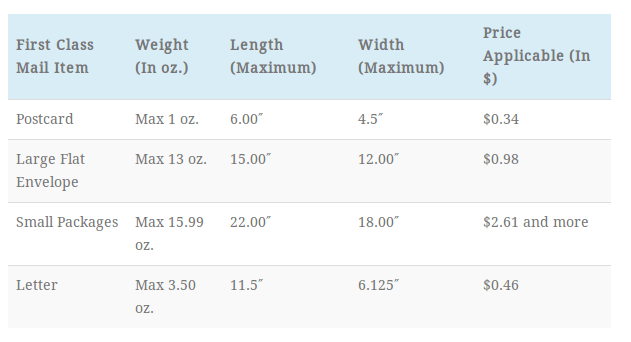 As mentioned above the package should be rectangular and with the below-mentioned weight, length, and width. The essential point to note is the shape of the package and if the package is non-rectangular excess amount will be charged. The letters which can’t be sent through the automated machines will cost you $0.21 postal charges. If the girth (distance around the package) is more than 108 inches, you will have to pick the package from the post office and send the same by using the Retail Ground Service of the USPS. If all conditions given are satisfied, then we can send the package through the First-Class Mail Service. For the ounce of the larger envelope, it costs around $0.98 and $2.61 for the first 3 ounces of the small packages. The people also often buy the add-on services for the First-Class Mail Service. For example, we have the Certified Mail which can be combined with this class mail to deliver the package. Print the complete address in the upper case letters (capital). Do not use any punctuation marks such as commas and colons. Use a pen or a permanent marker to write any information. Mention the ZIP code wherever required. If the package is damaged tick the option Fragile or Perishable. Do mention all the information precisely so that the package is delivered in time. How Fast is usps first class package service? How long does usps first class package take? As mentioned above the delivery time will be not more than 1 to 3 days, and this type of services will be used for the sake of business and personal deliveries. From the map, we can conclude that no matter how the package is the delivery will be done in 1 to 3 days all over the U.S. I hope that you all have got an idea about the USPS-First-Class Email Service with Delivery Time. If still, you have any queries do visit the official website of USPS for the information of USPS-First-Class Mail Service with Delivery Time.